Lexbe eDiscovery Platform individual case details are located under the 'Case' tab in the top navigation menu. Lexbe eDiscovery Platform's Case Details page enables your litigation team to maintain case specific information for easy reference. Case Name: Refers to how the case is identified. This could be the official case name from the tribunal, or a firm internal designation. This field displays on the dashboard and is used for the drop-down list there to allow you to change cases that you are working on. 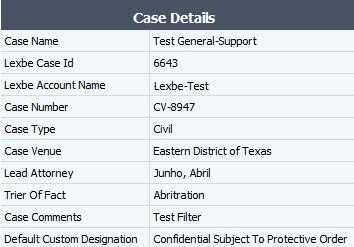 Case Id: It is an internal string of numbers generated by Lexbe eDiscovery Platform to keep track of each case. Case Number: This could include the official case number from the tribunal or an internal number you use. Case Type: This could be a general reference such as 'civil', 'criminal', 'arbitration', mediation'. Or If could refer to more specific designations such as 'commercial', 'insurance defense', etc. Case Venue: Indicates where the case is being administered. Lead Attorney: Allows you to designate a principal responsible attorney for the case. Trier of Fact: Allows you to designate who will be deciding the case: 'Jury Trial', 'Bench Trial', 'Arbitration'. Case Comments: Here you can include any other notes or comments that will be helpful in organizing or administering the case. Default Custom Designation: This is a default field value that will help you designate confidential information in a set of documents on a case level. The text you enter in that field (e.g. 'CONFIDENTIAL SUBJECT TO PROTECTIVE ORDER') will be the carried over to the Production Job and Download Briefcases pages. This is also an editable field and you can enter full text messages usually up to 50 characters. The Custom Designation tag is equivalent to the 'Attorney Eyes Only', 'Confidential', 'Subject to Protective Order' or other special designation for confidential documents and it will print a message on the lower right of a Bates stamp page once your production or download is complete. Lexbe eDiscovery Platform have three places where that field can be set. NOTE. If you want to have this field printed on document level during productions or document downloads, please read carefully the instructions displayed on the Production Job and Download Briefcases pages. Any of the case description fields can only be edited by Admin Users, by clicking on the 'Edit' hyperlink at the bottom of the screen, editing the appropriate field(s) and then saving by clicking 'Update'. After creating a new 'Case Field' under Management>Account>Manage Case Fields, it will not retain case information or automatically be assigned to all documents within your case, unless you updated it on the 'Case Details' page.